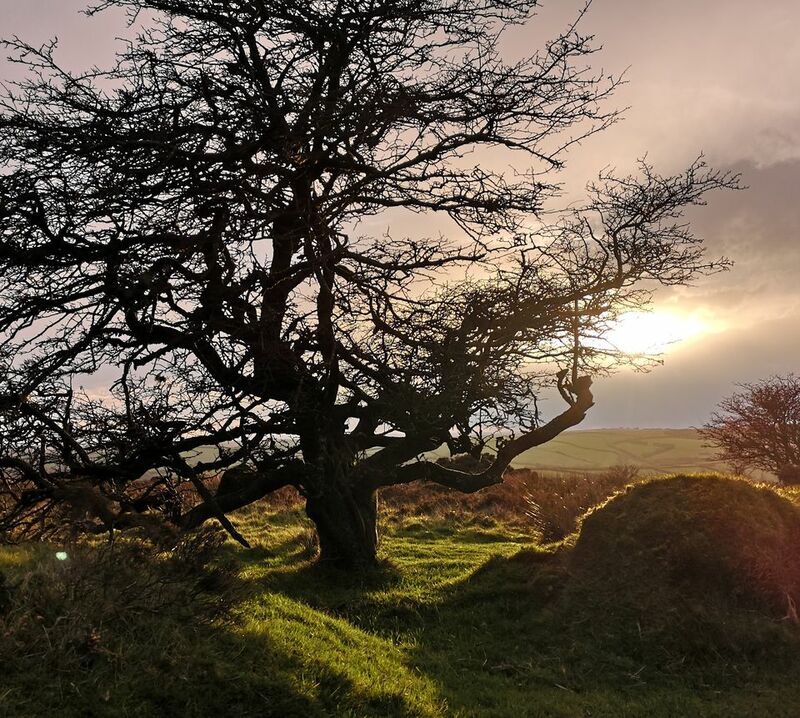 I have recently returned from a rewarding trip to Exmoor where I joined a group of like-minded artists. We sketched, photographed or painted on our own during the day according to our interests, and met up in the evening at local pubs to compare notes and relax. 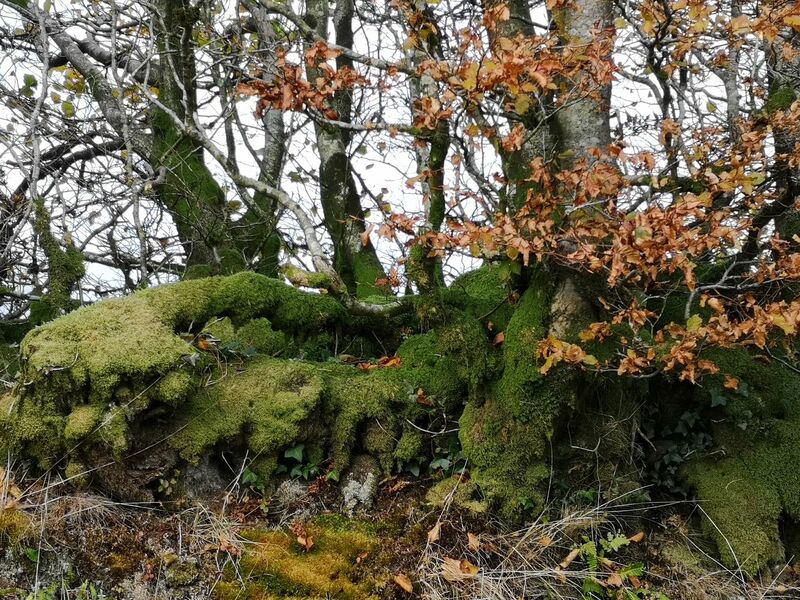 Exmoor is lined with wonderful beech hedges, their woven shapes growing out of stony banks. I love them especially in the autumn when the coppery leaves are still clinging and adding colour. Tiny toadstools and groups of round waxy pennyworts huddled against damp mossy trunks and rocks. 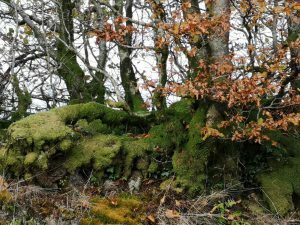 The woodlands were swathed in bracken and beams of low light seemed to search for and illuminate certain plants like a spotlight giving them a moment of fame. This is an opportunity for the artist to add a focal point to the otherwise wild and decorative patterns of nature. Some ferns had faded or bleached to a pale ochre colour reminding me of a brittle and yellowing piece of intricate Victorian lacework. After exploring the wood I decided to head over to open moorland and see if I could find some windswept hawthorns. I am still following the project that I set in my book Watercolour Workshop and am always looking out for new versions of my favourite trees to explore . I prefer these slightly scruffy commoners to the grander glories of tall and specimen trees. I drove through narrow high hedged tracks until I reached the cattle grid which meant I had arrived. My heart soared as I soon discovered that the way across the wild landscape was lined with perfect subjects. Some of them were silhouetted against a backdrop of coastline that looked towards Wales. As I leapt around excitedly the temperature suddenly plummeted. 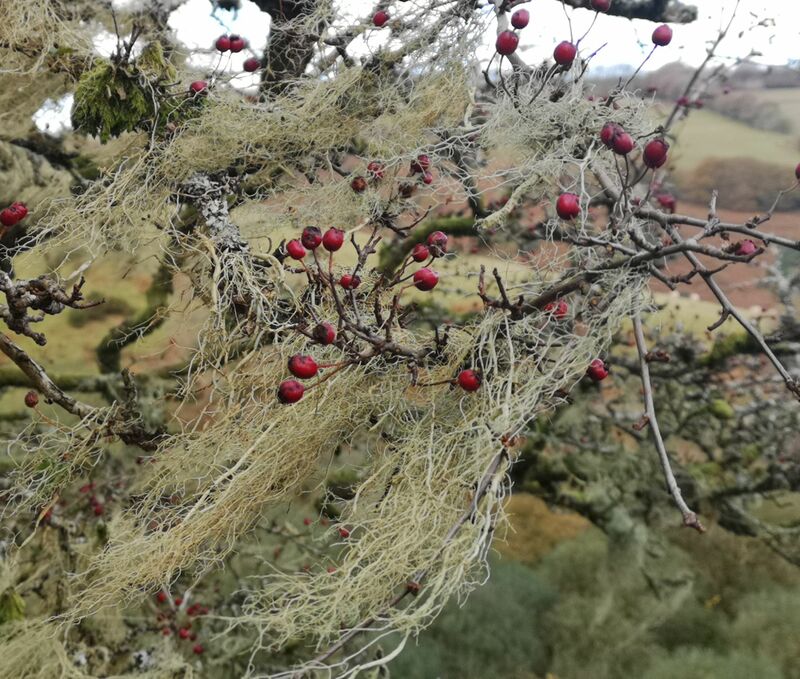 The air became painfully icy and a bitter wind crept through the frozen fingers of the hawthorn branches. Their gnarled and fissured bark and twisting shapes writhed and stretched in protest. An eerie pink glow across the sky was the only warning that hailstones were about to lash furiously across the hillside. This stopped as quickly as it began and the early evening sun counteracted with an intense and extraordinary light. 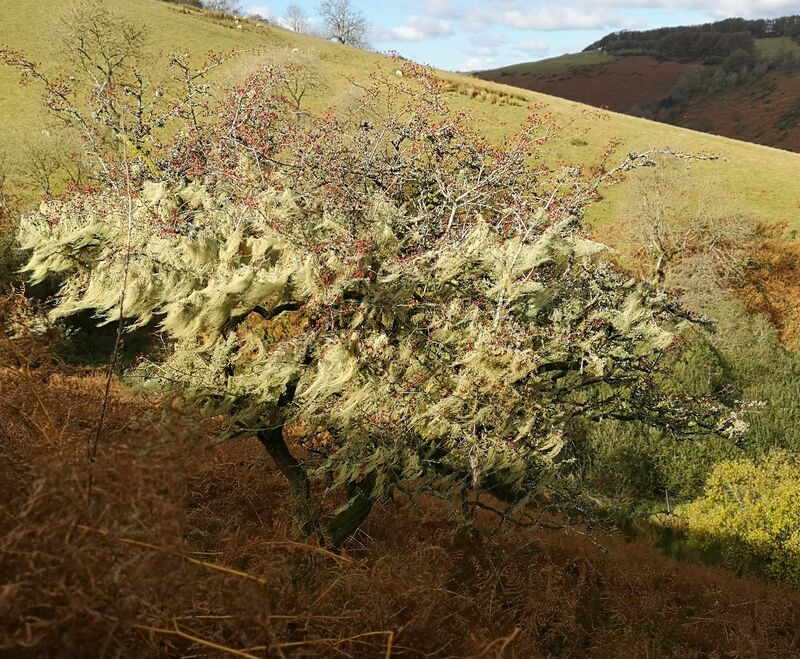 It etched highlights around each grassy tummock and shone through the nets of hawthorn twigs. 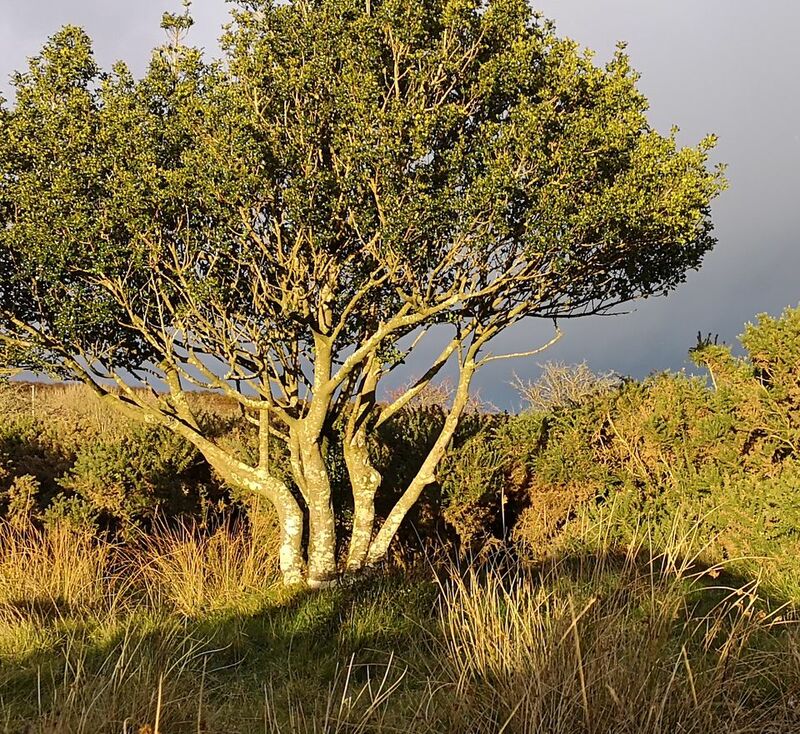 A small holly tree stood staunchly on the other side of the path, its trunk and branches bathed in light. I felt overloaded with so much information and imagery filling my senses. 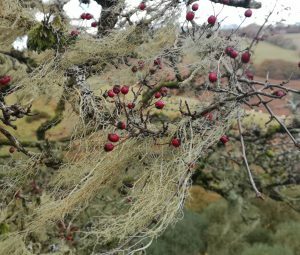 However, I could not resist the tip off I was given by my B&B hostess about a secret valley where the best lichen was to be found. The following morning I left the car on the side of an ordinary road and walked across an unpromising field. 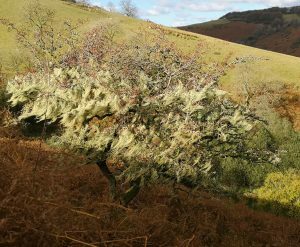 As the path descended on the other side of a gate I instantly encountered the most amazing hawthorns, dripping with fronds of lichen which dangled like wisteria from the tree. Strong sunlight turned it pale as blossom and its ribbons fluttered in a breeze through the russet and scarlet haws. A precious moment and parting gift as I headed back home.